Giraffes in their native African habitat chomp on tree leaves higher than other ground animals can reach. They run across the savannah with a gangly lope. Giraffe's necks often top 6 feet in length. Why that elongated feature evolved into the giraffe as we know it today is still up for discussion among scientists, with several theories batted around. Periods of drought make grazing food scarce in areas where giraffes live in Africa -- the lower to the ground, the scarcer. Several species of herbivores eat grass and low brush, but fewer animals can reach the tasty leaves high in the trees. Giraffes have the advantage over their grazing cousins of reaching higher for food. Trees tend to have leaves even when the grass dries up from lack of water. Their deeper roots help them survive, and their upper-canopy leaves help giraffes survive by providing food and moisture. Giraffes have keen eyesight, which helps them spot vegetation, predators and other giraffes from across the savannah. Their only main predator is the lion. Lions tend to hide in the tall grasses and try to blend in while hunting, but the giraffe's advantage of height combined with the keen eyesight give giraffes more warning than other lion prey get. While you or a rhino can't see a lion coming straight at you through the high grass, a giraffe can spot the creature from above long before the lion gets close. If you see male giraffes rubbing against each other's necks, you're not looking at love taps. These are likely two males fighting to win the attention of female giraffes. Males use their necks and heads as weapons to win female affection. They swing their heads and pound them into each other's necks with strong enough force to break bones. The longer the neck, the more powerful the swing can be, so the males with the longest necks are often the victors. That helps pass down the long-neck gene to the next generation. One way a giraffe's neck is poorly adapted is in the way the animal drinks water. As long as their necks are, they aren't long enough to get their faces to the ground easily. To drink, the giraffe must splay its front legs open or bend its front knees, which leaves it vulnerable to attack. It's not an easy position to stay in for any length of time. 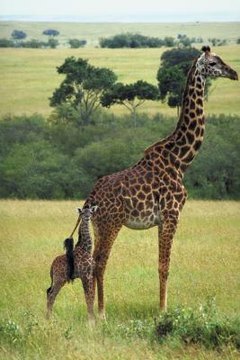 But giraffes work around this issue: They can go weeks without drinking, getting water from dew that gathers on the leaves and from the leaves themselves. New Scientist: Zoologger: How Did the Giraffe Get Its Long Neck? How Much Does a Giraffe's Neck Weigh?